Elliebelly Knit & Dye Works > Blog > Art > Susie, Don’t Read This! Before going any further, if you are Susie L., please consider turning back. Unless, of course, you’re the kind of girl who doesn’t like to wait to see things. Every year around this time, Joanne Huffman (make sure you look on her blog and see her beautiful buttons and art dolls) organizes an artist to artist swap. It’s always wonderful. This year, I spent a good bit of time on a collage, decided it wasn’t right for Susie, and ended up spending most of today making this little book, The Joy Of Ordinary Things, for her. 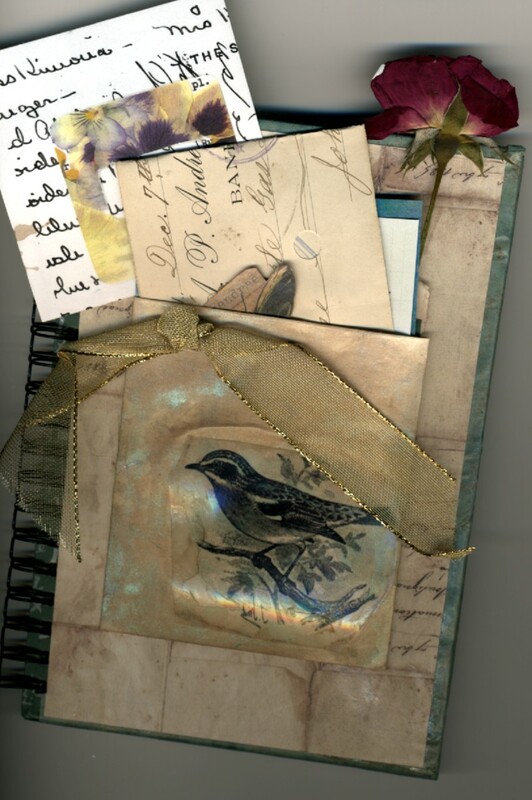 The book started life with profoundly ugly dull green covers with silver text, so I promptly covered them with one of my favorite patina papers, adding elements as I went along. I actually worked on the inside cover first. 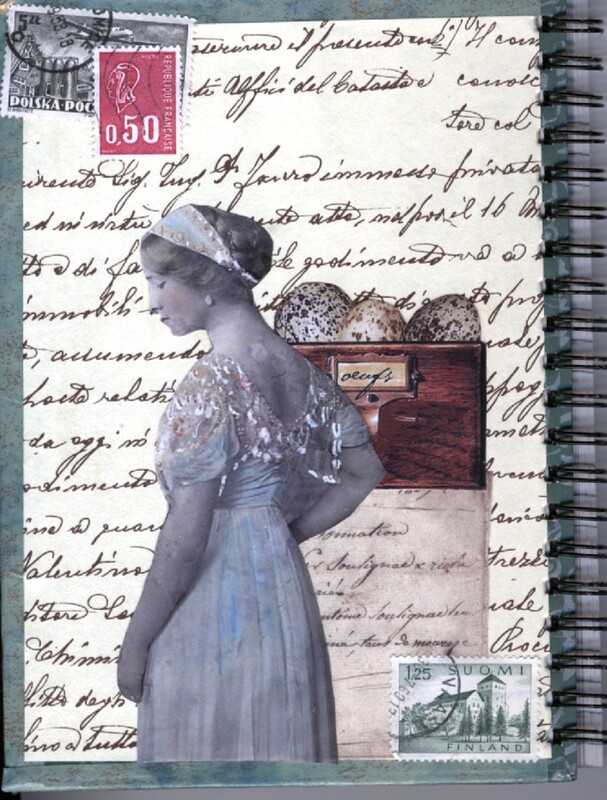 Using some Catherine Moore collage sheets, one of my own images, and vintage stamps. The inside cover done, I returned to the front, glued everything down and added the pretty ribbon and vintage button. 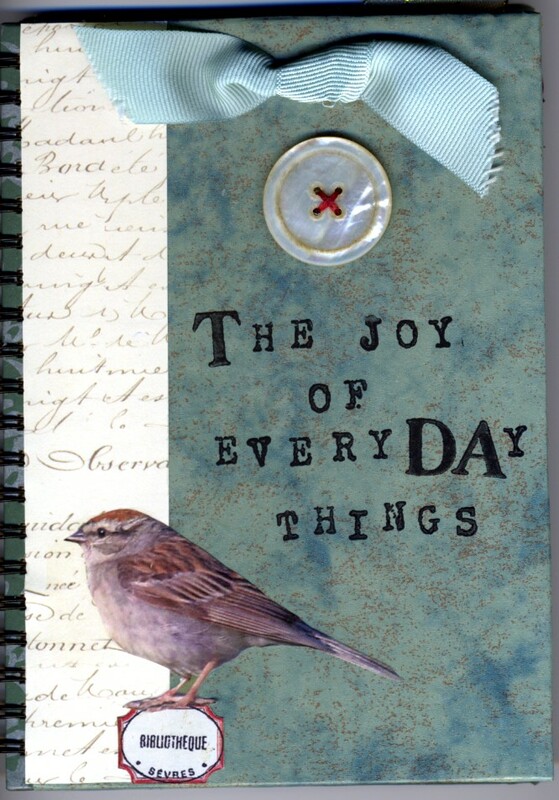 While I was gathering ephemera to work on the book, the phrase, "the joy of everyday things" had popped into my head — a concept I think about a lot — so I decided to stamp it on the front cover. I knew that I wanted to do something interactive on the inside of the back cover (the outside is simply covered in the patina paper) and decided upon a little pocketful of inspiration. 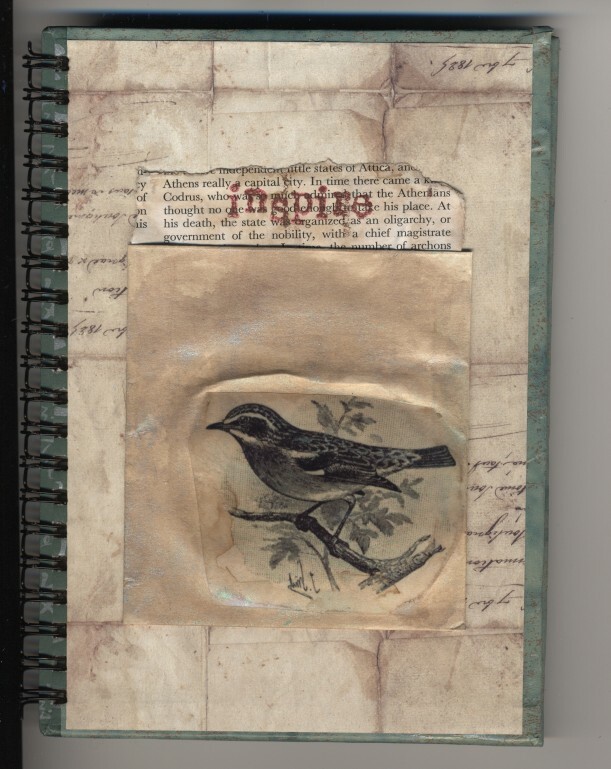 I arted up a library pocket, using a Teesha Moore image, some of my favorite Moonshadow inks, and rubberstamping the word inspire on some old text. After everything was dry, I added in some butterfly images, paste papers, a dried rose, a vintage telegram, and a few other little goodies I hoped Susie would find inspiring. Joyce, this is a lovely book and Susie is sure to be thrilled.